Flyball is essentially a relay race between 2 teams of 4 dogs, racing against each other in separate lanes. Each dog on the team must jump 4 hurdles, retrieve a tennis ball from a spring-loaded device called a "box", and return back over the hurdles again with the ball. As soon as the first dog returns, the second dog is released. The dogs should pass each other as close as possible on the start line, this is referred to as a "changeover", "cross" or "pass". The winning team is the first one to get all four dogs over the course and back again with no faults or early changeovers. 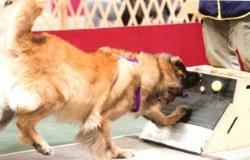 Although a giant breed, leonbergers love to "work" and to "socialize" which makes flyball a possibility for interested owners. 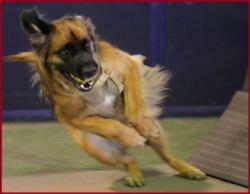 Havoc does Flyball; he has FMX and is a member of the Flash Point Flyball club. Havoc, Anchor Creek's Anarchy on Thunder Hill, owned and handled by Mary Kline. For the long-term health of the dogs, they must be 18 months old before they can compete in Open Flyball tournaments, and 12 months before they can compete in Starters. Dogs are trained to turn in a certain way on the box (known as a swimmer's turn) to minimize impact on the joints.